The official weigh-ins for “UFC Fight Night: Nelson vs. Nogueira” took place Thursday at Cornish’s East Plaza in Abu Dhabi, United Arab Emirates. The UFC was having issues with their live stream, so video is not currently available. 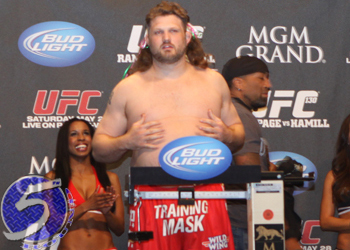 Heavyweight Roy Nelson (pictured) battles former interim champ Antonio Rodrigo Nogueira in the show’s featured attraction. Veterans Clay Guida and Tatsuya Kawajiri meet in the co-main event. UFC Fight Pass streams the entire card live starting at 12:15AM ET/9:15AM PT.